The key purpose of www.outsource2india.com is be a vibrant business and resource tool about outsourcing to our valuable customers, researchers, prospects, analysts and media personnel. When you visit our website, you can feel completely secure, as we are dedicated to safeguarding the privacy of our visitors. Please read the following information, before you use or submit personal data on this website. Here is an overview of how we protect your privacy when you visit our website. Contact us forms: Information on our site is gathered directly when you voluntarily provide information through our contact us form, request for information form, query forms or conference/event registration forms. You have the complete freedom of whether or not you want to submit personal information to our website. Cookies: We also collect information from cookies, which provide us details about how you entered our site, what information you viewed and how you navigated through our site. This information will not be reviewed at an individual level. In case, you do not want your information to be used, you can disable your cookies or opt out at the request or download page. Internet access logs: We also collect information indirectly through our site's internet access logs. When you browse through our site, your internet address is automatically collected and placed in our internet access logs. The information that we collect on our website, is analyzed to help us understand what is most effective on the site and also to help us improve the site to make it more useable for our visitors/customers. At times, the information may also be used to send direct mails or newsletters which will inform you about our new services, events and conferences. If you do not wish to receive our mails, you can opt-out by choosing to unsubscribe. 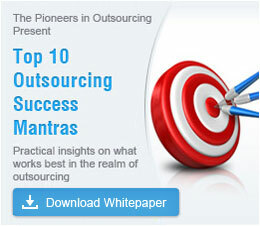 At Outsource2india, we share individual information only with our trusted employees and partners. At any given time, individual information will not be shared with or sold to outside parties. This website may contain links to other sites.Outsource2india is not responsible for the content or privacy practices of such websites. Outsource2india takes physical and electronic security measures to preserve and manage all personal information submitted by the users on our website. Our security measures protect the misuse, loss and alteration of information. Our data is kept secure behind a firewall, with limited access only to authorized personnel at Outsource2india. All information will be kept secure against, damage, loss, destruction or unauthorized reproduction of data - digitally or physically. At outsource2india, we store basic customer details like their name, company name, country name, email, telephone number, etc. Apart from these, we also store web data such as the cookies, IP address, and system location purely for business purposes, so that we can contact our clients in future about our services, products, or unique projects requirements. Any email is sent strictly on an opt-in basis, and clients / EU citizens can ask us to discontinue processing their personal data or delete it altogether. We respect the privacy and confidentiality of our clients and never share their personal data to third-parties for marketing purpose. We can also provide the electronic copies of the processed records, along with the purpose for which it was stored and its location, upon request. We are GDPR compliant, and believe that you have the right to have access information given to us. In case, you require the information to be corrected or if the information is inaccurate, you can contact us here.